The company Space Exploration Technologies, better known as SpaceX, broke ground Wednesday (July 13) on a new launch site for its massive heavy-lift rocket. SpaceX is upgrading a site called Space Launch Complex 4-East at Vandenberg Air Force Base near Santa Barbara, Calif. The refurbished launch complex will host SpaceX's Falcon Heavy rocket, which the company says will be more powerful than any launch vehicle currently in service. Several dignitaries attended Wednesday's event, including SpaceX CEO and chief rocket designer Elon Musk and California Lt. Gov. Gavin Newsom, company officials said. According to the Los Angeles Times, SpaceX is pouring about $30 million into the new launch site, with the aim of securing large launch contracts with the Air Force. Currently, the United Launch Alliance — a joint venture of Boeing and Lockheed Martin — launches all payloads for the United States Department of Defense. Musk made it clear that SpaceX wants a piece of the military satellite market. "These are difficult fiscal times for our federal government, and the Falcon vehicles can save the Department of Defense almost $2 billion per year in launch costs, while increasing reliability and capability," Musk said in a statement. "This presents a great opportunity for the DoD to avoid cancelling other programs and minimize reductions in personnel as budgets contract." The Falcon Heavy boasts 27 of SpaceX's Merlin engines, three times as many as the company's Falcon 9 rocket. The heavy-lifter will be able to loft about 117,000 pounds (53,000 kilograms) of cargo to orbit, about twice as much as the United Launch Alliance's Delta 4, which is the most powerful rocket currently in operation, company officials said. The new heavy-lifter is to arrive at Vandenberg by the end of 2012, and its inaugural flight will follow soon after, SpaceX officials said. 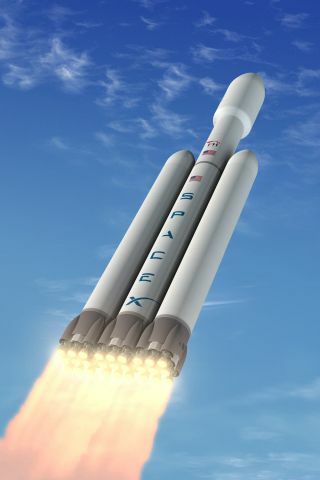 The Falcon Heavy is designed to stand 227 feet (69.2 meters) tall and weigh about 3.1 million pounds (1.4 million kg). It would incorporate the standard Falcon 9 rocket, with two liquid-powered Falcon 9 first-stage boosters strapped on its sides. The price for a launch aboard the new Falcon Heavy is set for $100 million, compared with the $50 million price tag for a Falcon 9 liftoff, Musk has said. Space Launch Complex 4-East has a long history, but it hasn't been used for more than half a decade. The first launch from the site took place in 1964, while the last blasted off in 2005.